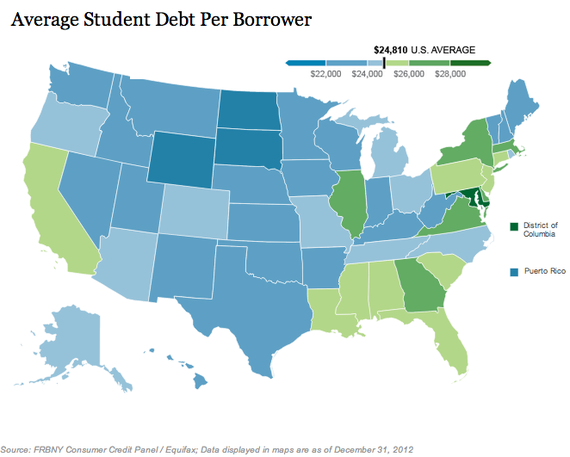 ..:recycled minds:..: Student Debt in the US: Is There an End in Sight? 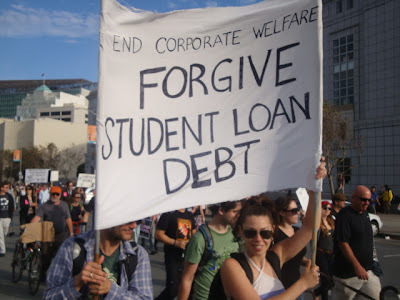 Students march in support of student debt forgiveness in San Francisco. Photo courtesy of jjinsf94115 on Flickr. The student debt issue has been back in the news recently, with a number of commentaries on what some are saying may be the next 'bubble'. With currently fixed interest rates on student loans set to double from 3.4% to 6.8% on July 1st, 2013, there is a growing call for some sort of relief plan. Last year we began to see some evidence that the issue was something deserving of attention. I first wrote briefly about my student loan experience in October 2012, just after returning from a year and a half of fieldwork, beginning the process of writing my dissertation, and already getting harrassed by the banks for repayment. Since then, my own situation has not improved, and neither has that of millions of students throughout the US, as overall student debt breached $1 trillion US earlier this year. It seems that the trillion-dollar may have been the turning point that mark pushed the issue into the mainstream. One sign of this is that Yahoo has recently begun publishing a series of "First Person"articles on student debt that share "first-person accounts from those who are still paying and those who have lessons to share." With the announcement that the US government is set to earn $51 billion US from student loan borrowers this year alone, there seems to be a growing consensus that the need for reform has reached critical levels. There are a number of proposals from various arms of the US government that would attempt to alleviate some of the pressure on indebted students by addressing interest rates on the loans. Republicans, in a bill titled The Smarter Solutions for Students Act, are proposing to switch student loan interest rates from a fixed rate to a variable one, tied to the 10-year Treasury note rate. The White House has proposed something similar, also tied to the Treasury note rate, that would save borrowers in the short term, but actually cost them more in the long run. There is also a proposal from a Democratic Senator that would lower interest rates on student loans to the same low rate that banks pay on their federal loans (a very low 0.75%). Both the Republican, and White House proposals have come under scrutiny by student advocates for not going far enough, and the Democratic proposal appears to be too radical a move for legislators. A recent piece in the Atlantic begins to get at the nuances of the student debt crisis, arguing that it's not only the overall size of the debt that matters. Using data from the Federal Reserve bank of New York, the article shows that where you live, your age, and other factors play a role in how much student debt you have, and how well you have been able to pay it off. For instance, I accrued most of my student debt in graduate school in Florida, a state where students hold student debt at above the national average, and where delinquency rates on repayment are among the highest in the nation. Whatever the reasons for the spiraling student debt crisis, what is clear is that hundreds of thousands of students are entering the work force already in serious debt. It seems that we have allowed the banks to create another era of unparalleled debt peonage. Without some kind of action, whether political or popular, our students are now increasingly facing the burden of trying to get even before they start working. Our future will certainly be interesting to watch unfold. This is definitely another bubble that is going to burst. The US has let the banks and corporations take full control, and the country will continue to see the rich get richer, the poor get poorer, and the gap between them will get bigger and bigger. Don't pay! Are the banks our rulers? The banks got bailed out for their dishonesty already, and they only continue to find ways to screw you. We need collective action, and if enough people don't pay their student loans we'll see another situation where they need bailed out again. Maybe this time, the response will be different.